Born and raised in Transylvania, Romania, guitarist/composer Zsolt Bende started playing classical violin and piano at the age of 6 and jazz guitar at 17. After '89, Zsolt took the opportunity to leave Romania for Budapest, Hungary, where he immersed himself in the local jazz scene. In 1994 he moved to London and continued performing and developing his musicianship. While playing with leading British musicians, he auditioned for the prestigious Berklee College of Music in Boston. Upon receiving this scholarship in 1996, he studied jazz composition and performance with John Abercrombie, George Garzone, Hal Crook, Mick Goodrick and Charlie Banacos (Mike Stern and Michael Brecker's former teacher). In 1997, Zsolt was awarded the Berklee Guitar Department's Outstanding Achievement Award in recognition for his hard work, dedication and talent, and in 2000 he returned to the UK to join The Arnie Somogyi Quintet. The band (featuring saxophonist Tony Lakatos and pianist Liam Noble) debuted at Ronnie Scott's Club, and its subsequent CD, Cold Cherry Soup, was met with widespread acclaim, including BBC Music Magazine's Pick of the Month. Zsolt's recent return to Budapest has him performing his original music with his band at various venues and festivals throughout Europe. He is also a member of the band Improvokation, which combines the musical heritage and creative talents of some of the world's leading improvisational musicians from both Hungary & the UK. His upcoming releases include works written for his quartet and sextet. 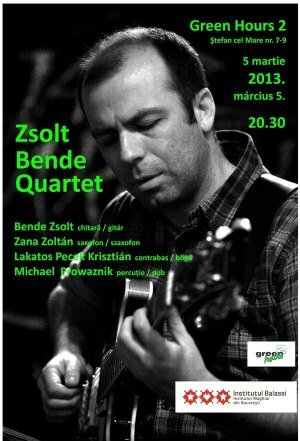 "Zsolt Bende Quartet @ Green Hours 2" Concert in Bucharest. You can get here description, reviews, address, time and details of "Zsolt Bende Quartet @ Green Hours 2" Concert in Bucharest. Visit Bucharest Tips for more Concert events in Bucharest!